"Unfortunately, a whole number of my quotes were misinterpreted." The head of the Odesa regional state administration, Mikheil Saakashvili, has said that his critical remarks about Volodymyr Hroysman's cabinet in the interview he gave to Guardian journalist Shaun Walker were misinterpreted. 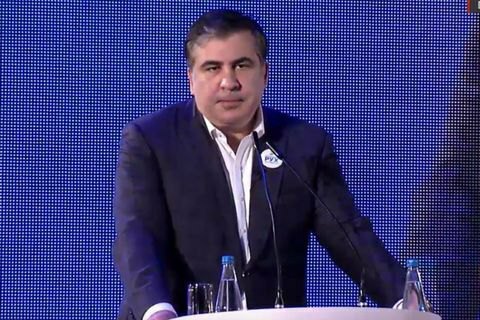 The paper said that Saakashvili described the government as a "bunch of mediocre people", which the governor insists on Facebook he did not say. "I have serious complaints about the way Ukraine's Cabinet of Ministers was formed as a result of many collusions and concessions and we indeed have a weaker government than what we would like to have. My friend Volodymyr Hroysman, with which we share views on many issues, found itself in a rather confusing position, but I would not describe this government as a 'bunch of mediocre people', although it has some people marred in corruption, members of Arseniy Yatsenyuk's government and those who are very weak in the face of challenges faced by Ukraine. I am quite critical of the problems of our authorities, but, unfortunately, a whole number of my quotes were misinterpreted," he said. He hopes the newspaper will issue a correction. It is not the first time Saakashvili says he was misinterpreted by foreign journalists.